Wasit? I thought it was last month. Customer: Does this shop sell * Swedish shampoo ? Shop assistant: Yes. We have some special Swedish shampoo on this shelf. Practise this conversation. Use the *list above. First practise [∫]. Use your voice to make . ConversationTalk about the television programmes. A: What are you going to watch on television tonight ? DrillWhen somebody says 'Thank you' for doing something, we sometimes say, 'It's a pleasure'. Practise this answer. A: Thank you for lending me your television. 1 Thank you for mending my television. 2 Thanks for lending me your measuring tape. 3 Thanks for lending me 'Treasure Island'. 4 Thank you for letting me use your garage. 5 Thanks for letting me drive your Peugeot. 6 Thanks for letting us watch your television. First practise [t] and [∫]. 1 Begin to make [t]. 2 Then slowly move your tongue from the roof of your mouth. Butcher: Mrs Church: Butcher: Mrs Church: Butcher: Mrs Church: Butcher: Mrs Church: Butcher: Good morning, Mrs Church. Good morning, Mr Cheshire. I'd like some chops for the children's lunch. Chump chops or shoulder chops, Mrs Church ? I'll have four shoulder chops, and I want a small chicken. Would you like to choose a chicken, Mrs Church ? Which one is cheaper? This one's the cheapest. It's a delicious chicken. How much is all that? I haven't got cash. Can I pay by cheque? Of course, Mrs Church. 1. Pour a little sherry over the chops. 2. Chop the mushrooms, cheese and shallots. 3. Mix the mushrooms, cheese, shallots and chilli. 5. Put the chops in a dish. 6. Spread the mixture over the chops. 7. Grill the chops and mixture for a few minutes. 8. Serve the chops with fresh French salad and chips. First practise [t∫]. Use your voice to make [d3]. Jerry: John: Jerry: John: Jerry: John: Jerry: John: Jerry: John: Jerry: Just outside this village there's a very dangerous bridge. Yes. Charles told me two jeeps crashed on it in January. What happened? Well George Churchill was the driver of the larger jeep, and he was driving very dangerously. He'd been drinking gin. George Churchill ? Do I know George Churchill ? Yes. That ginger-haired chap. He's the manager of the travel agency in Chester. Oh, yes. I remember George. He's always telling jokes. Well, was anybody injured ? Oh, yes. The other jeep went over the edge of the bridge, and two children and another passenger were badly injured. Were both the jeeps damaged? Oh, yes. And what happened to George ? George? He's telling jokes in jail now, I suppose! When two sounds [t∫] or [d3] come together, you must say both sounds. Touch your top teeth with your bottom lip. Blow out air between your lip and your teeth. Phillip: Photographer: Phillip: Phillippa: Photographer: Phillippa: Photographer: Phillip: Photographer: Phillip: Phillippa: Photographer: Phillip: Photographer: I want a photograph of myself and my wife. Please fill in this form, sir. Would you prefer a full front photograph or a profile? A full front, don't you think, Phillippa ? Yes. A full front photograph. Please sit on this sofa. Is it comfortable, Mrs Puffin? Yes. It feels fine. Mr Puffin, please give a friendly laugh. That's difficult. If you say something funny I can laugh. And, Mrs Puffin, please look soft and beautiful. (laughs) Is it finished? Yes. Will the photograph be ready for the first of February ? Yes. Please phone my office after five days, Mr Puffin. If Fred /laughs,he looks \funny. If Grandfather /flies,he gets \frightened. If Fred laughs, If Phillippa laughs, If Grandfather flies, If you want to eat fish, If you telephone information, If you fry food, If a man has a wife, If you finish before the others, he isn't free. he gets frightened. she looks beautiful. you're first. it gets full of fat. they're helpful. he looks funny. you need a knife and fork. If Fred laughs, he looks funny. First practise [f]. Use your voice to make [v]. Vera: Victor: Vera: Victor: Vera: Victor: Has your family lived here for very long? Five and a half years. We arrived on the first of February. What a fine view you have! Yes. I love living here. Look! You can see the village down in the valley. Yes. It's a lovely view. This is a photograph of a fat farmer arriving at a village in the valley. He's driving a van. It's a fine day, but it's November, and the leaves have fallen from the vine in the front of the photograph. 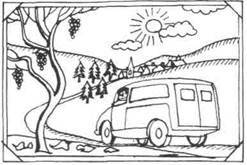 1 Who's driving the van? 2 How many leaves have fallen from the vine? 3 Where do the villagers live? 4 Is the van leaving or arriving ? 5 Is it a vine or a fir tree in the front of the photograph ? 6 Are there four or five fir trees near the village? First practise [u:]. Make your lips round and hard for [w]. [w] is a short sound. Gwen: Wendy: Gwen: Wendy: Gwen: Wendy: Gwen: Wendy: Did you see Victor on Wednesday, Wendy ? Yes. We went for a walk in the woods near the railway. Wasn't it cold on Wednesday ? Yes. It was very cold and wet. We wore warm clothes and walked quickly to keep warm. It's lovely and quiet in the woods. Yes. Further away from the railway it was very quiet, and there were wild squirrels everywhere. We counted twenty squirrels. How wonderful! Twenty squirrels! And did you take lunch with you? Yes. About twelve we had veal sandwiches and sweet white wine, and we watched the squirrels. It was a very nice walk. Where was it \quiet? What did they \drink? Why did they walk \quickly? In the \woods. Sweet white \wine. To keep \warm. Where was it quiet? What did they watch ? What did they drink ? Where were the squirrels ? Why did they walk quickly ? What did they eat for lunch ? What time did they have lunch ? What did Victor and Wendy do on Wednesday ? The squirrels. In the woods. To keep warm. Twelve o'clock. In the woods. They went for a walk. Veal sandwiches. Sweet white wine. First practise [i:]. Very quickly move your tongue to make the next sound. Do not touch the roof of your mouth with your tongue. Jim: Jack: Jim: Jack: Jim: Jack: Jim: Jack: Jim: Jack: Jim: Jack: Excuse me. Did you use to live in York? Yes. Did you use to be a tutor at the University ? Yes. For a few years. Do you remember Hugh Young ? He was a music student. Hugh Young? Did he use to have a huge yellow jeep ? Yes. And he used to play beautiful tunes on the tuba. Yes, I knew Hugh. He used to be a very stupid student. Do you have any news of Hugh ? Yes. He's a millionaire now in New York. A millionaire? Playing the tuba? Oh, no. He produces jam in tubes, and tins of sausages and onion stew, and sells them in Europe. I read about Hugh in the newspaper yesterday. Oh! Well, he wasn't so stupid. A: When you were very young, did you use to wash yourself? B: Yes I did. / No, I didn't. Push a lot of air out very quickly. Helen: Ellen: Helen: Ellen: Helen: Ellen: Helen: Ellen: Helen: Ellen: Helen: Ellen: Hello, Ellen. Hello, Helen. Have you heard? There's been a horrible accident. Oh, dear! What's happened? Hilda Higgins' husband has had an accident on his horse. How awful! Is he injured? Yes. An ambulance has taken him to hospital. How did it happen ? He was hit by an express train. It was on the crossing just behind his house. How horrible! He's having an important operation in hospital now. Poor Hilda! She's so unhappy. Perhaps he'll be all right. I hope so. A: Harold has had an accident. 1 A helicopter has hit Allen's house. 2 Harry has a hole in his head. 3 Andrew spent all his holiday in hospital. 4 Hilda hit herself with a heavy hammer. 5 Ellen's husband is ill in hospital. 6 I've hurt my hand and I can't hold anything. Put your tongue between your teeth. Blow out air between your tongue and your top teeth. Judith: Ethel: Judith: Ethel: Judith: Ethel: Judith: Ethel: Judith: Ethel: Judith: Ethel: Judith: Edith Smith is only thirty. Is she? I thought she was thirty-three. Edith's birthday was last Thursday. Was it? I thought it was last month. The Smiths' house is worth thirty thousand pounds. Is it? I thought it was worth three thousand. Mr Smith is the author of a hook about moths. Is he? I thought he was a mathematician. I'm so thirsty. Are you ? I thought you drank something at the Smiths'. No. Edith gave me nothing to drink. Shall I buy you a drink ? Thank you. Is she? I thought she was thirty-three. Isit? I thought it was worth threethousand. Areyou? I thought you dranksomething. First practise [θ]. Use your voice to make [ð]. What's this? What are those ? What's that? What's this? What's that? What are these ? Who's that? This is the zoo. Those are zebras. That's a zebu. This is Z. That's zero. These are zips. That's Zack. Miss Brothers: Assistant: Miss Brothers: Assistant: Miss Brothers: Assistant: Miss Brothers: Assistant: I want to buy the hat in the window. There are three hats together in the window, madam. Do you want the one with the feathers ? No. The other one. The small one for three pounds? No. Not that one either. That one over there. The leather one. Ah! The leather one. Now this is another leather hat, madam. It's better than the one in the window. It's a smoother leather. I'd rather have the one in the window. It goes with my clothes. Certainly, madam. But we don't take anything out of the window until three o'clock on Thursday. Which hatdo youthink is betterthan the others ? I think the onewith the feathers is better than the others. Close your lips. Use your voice, [m] comes through your nose. Jim: Mrs Smith: Jim: Mrs Smith: Jim: Mrs Smith: Jim: Mum, may Tom Mitcham come home with me for tea tomorrow ? Of course, Jim. Have I met Tom before? You met him in the summer. He's very small and smart. Oh, yes. I remember Tom. Does his family come from Cambridge ? Yes. Oh, Mum! Will you make some home-made crumpets tomorrow ? Mm ... maybe. If I have time. I told Tom about your crumpets, Mum. That's why he's coming for tea tomorrow! Now listen to this conversation and say which meaning 'Mm' has in B's answers. A: Would you like some home-made crumpets ? A: Would you like some crumpets ? A: I'm glad you like them. I made them myself. Would you like to try them with marmalade ? A: Marmalade. They're marvellous with marmalade. Would you like some ? Put your tongue on the roof of your mouth. Touch your side teeth with the sides of your tongue. Use your voice, [n] comes through your nose. Mr Mason: Manager: Mr Mason: Manager: Mr Mason: Manager: Mr Mason: Good morning. I want an apartment in central London. Certainly, sir. How much rent did you want to pay? No more than £27 a month. £27 a month? We don't often have apartments as inexpensive as that. We have one apartment for £29 a month in Northend Avenue. It's down near the station. Is it furnished? No. It's unfurnished. The kitchen has no oven. It's forbidden to use the garden. No friends in the apartment after eleven in the evening. No noise and no television after 11.15. No ... No thank you! I want an apartment, not a prison! Touch the back of the roof of your mouth with the back of your tongue. Use your voice, [ŋ] comes through your nose. Mr Pring: Mrs Pring: Mr Pring: Mrs Pring : Mr Pring: Mrs Pring: Mr Pring: Mrs Pring: Mr Pring: Mrs Pring: Mr Pring : Mrs Pring: Mr Pring: (angrily). Bang! Bang! Bang! What are the Kings doing at seven o'clock on Sunday morning? Well, Mr King is singing. Yes, but what's the banging noise? (looking out of the window) He's standing on a ladder and banging some nails into the wall with a hammer. Now he's hanging some strong string on the nails. And what's Mrs King doing? She's bringing something pink for Mr King to drink. Now she's putting it under the ladder, and... Ohh! What's happening? The ladder's falling. What's Mr King doing? He's hanging from the string. He's holding the string in his fingers and he's shouting to Mrs King. And is she helping him ? No. She's running to our house. Now she's ringing our bell. I'm not going to answer it. I'm sleeping. First practise [n]. 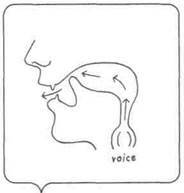 To make [l], the air goes over the sides of your tongue and out of your mouth. Practice 2Look at the picture. Then answer the questions. 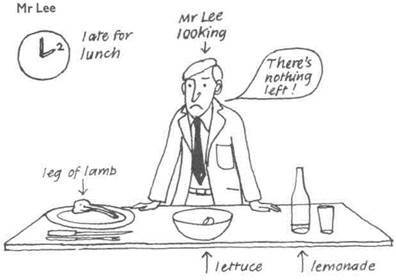 What's Mr Lee looking at ? Is there a lot of lemonade left or only a little ? Is there any lettuce left ? Why is Mr Lee complaining ? Mr Allen: Waitress: Mr Allen: Waitress: Mr Allen: Waitress: Mr Allen: Waitress: Mr Allen: Hello Lily. You're looking lovely today. Hello, Mr Allen. You're early for lunch. It's only eleven o'clock. When I come later there's usually nothing left. What would you like ? Leg of lamb, please. And would you like a plate of salad? It's lettuce with black olives. Marvellous! I love olives. And would you like a glass of lemonade? Yes please, Lily. And a slice of melon and some yellow jelly. Paul: Uncle Bill: Salesman: Uncle Bill: Paul: Salesman: Paul: Uncle Bill: Paul: What a beautiful bicycle! Paul! Be careful! Excuse me, sir. This child is too small to ride this bicycle. It's a very difficult bicycle to ... Be careful, Paul! You always tell me to be careful. Don't help me. I won'tfall. But, sir. This is a very special bicycle. It's ... Don't pull the bicycle, Uncle Bill. I'll do it myself. Be sensible, Paul. This gentleman says it's a ... (Paul falls) It was Uncle Bill's fault. He was holding the bicycle. Turn the tip of your tongue up as in the picture. The sides of your tongue should touch your back teeth. Mrs Randal: Mrs Reed: Mrs Randal: Mrs Reed: Mrs Randal: Mrs Reed: Mrs Randal: Mrs Reed: Mrs Randal: Mrs Reed: Mrs Randal: Mrs Reed: Mrs Randal: Mrs Reed: Are all the children grown up now, Ruth? Oh, yes. Laura is the cleverest one. She's a librarian in the public library. Very interesting. And what about Rita? She's a secretary at the railway station. And what about Rosemary? She was always a very pretty child. Rosemary is a waitress in a restaurant in Paris. She's married to an electrician. And what about Jerry and Roland? Jerry drives a lorry. He drives everywhere in Europe. Really? Which countries does he drive to? France and Austria and Greece and Russia. And does Roland drive a lorry too? Oh, no. Roland is a pilot. Really? Which countries does he fly to? Australia and America. The letter [r] is silent in these words. When there is no vowel following it, [r] is silent. DialogueIn this dialogue every letter [r] is silent. Announcer: Dr Darling: Mr Martin: Dr Darling: Mr Martin: Air hostess: Mr Martin: Air hostess: The 2.30 plane to New York will depart later this afternoon at four forty-four. Passengers on this flight are forbidden to leave the airport. Wonderful! I'm going to the bar to order some more German beer. Where's the bar? It's upstairs. There's a bookshop too. And a supermarket. This is a marvellous airport! Oh dear! I wanted to get to New York earlier. Ah! Here's an air hostess. Excuse me. I don't understand. Has there been an emergency? Oh, no, sir. There's just a storm, and the weather forecast says it will get worse. So the plane will leave a little later this afternoon. Are you sure ? Oh, yes, sir. Our departure time is at four forty-four.